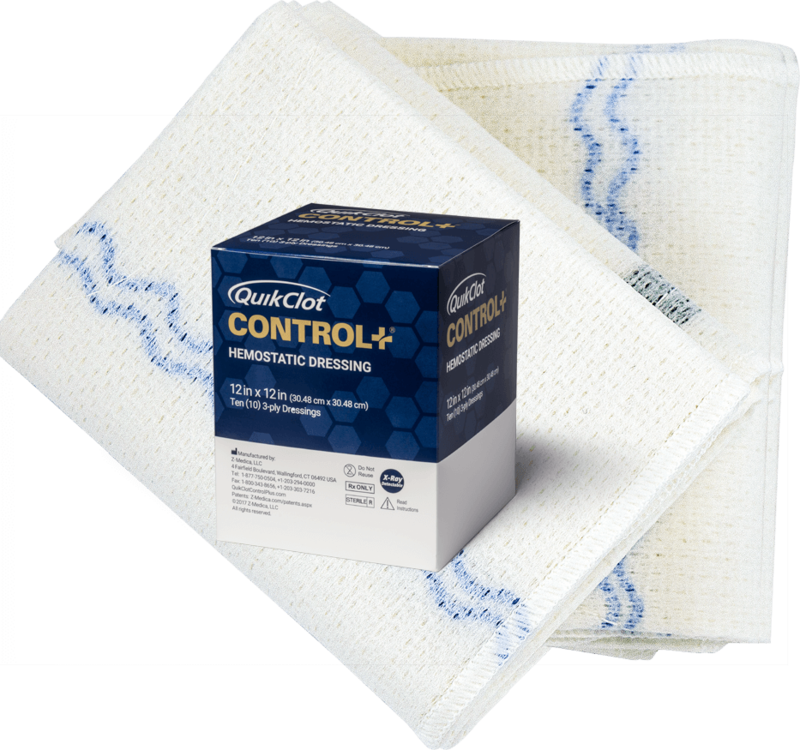 QuikClot Control+® is the first and only hemostatic dressing indicated for temporary control of internal organ space bleeding for patients displaying class III or class IV bleeding. A new option that can be delivered quickly, easily and reliably to offer effective, safe and efficient performance in the worst bleeds. QuikClot Control+ is just the latest innovation from Z-Medica®. Since 2002, the company has been developing and delivering superior hemostatic devices to healthcare providers, military personnel, first responders, and consumers around the world. QuikClot Control+ is impregnated with kaolin, a naturally occurring, inorganic mineral that accelerates the body’s natural clotting process.1,2 It’s the same active ingredient used in QuikClot Combat Gauze®. Because kaolin contains no animal or human proteins, no thrombin, fibrinogen, botanicals, or shellfish products, there is no risk of allergic responses.1-3 Biocompatibility studies have shown that it is safe and has no negative effect on tissues.3 Integrated double X-ray indicators facilitate detection and removal, reducing the risk of lost or retained product. Koko KR, McCauley BM, Gaughan JP, et al. Kaolin-based hemostatic dressing improves hemorrhage control from a penetrating inferior vena cava injury in coagulopathic swine. J Trauma Acute Care Surg. 2017;83(1):71-76. All animals treated with QuikClot Control+ (100%, 6/6) survived, compared to 83% (5/6) of animals treated with standard packing. Significantly less blood loss after packing was seen with QuikClot Control+ (651+/-180 ml) compared to standard packing (1073+/-342 ml) (p≤0.05). REFERENCES: 1. Trabattoni D, Montorsi P, Fabbiocchi F, Lualdi A, Gatto P, Bartorelli AL. A new kaolin-based haemostatic bandage compared with manual compression for bleeding control after percutaneous coronary procedures. Eur Radiol. 2011;21:1687-1691. 2. Lamb KM, Pitcher HT, Cavarocchi NC, Hirose H. Vascular site hemostasis in percutaneous extracorporeal membrane oxygenation therapy. Open Cardiovasc Thorac Surg J. 2012;5:8-10. 3. Data on File. 4. Koko KR, McCauley BM, Gaughan JP, et al. 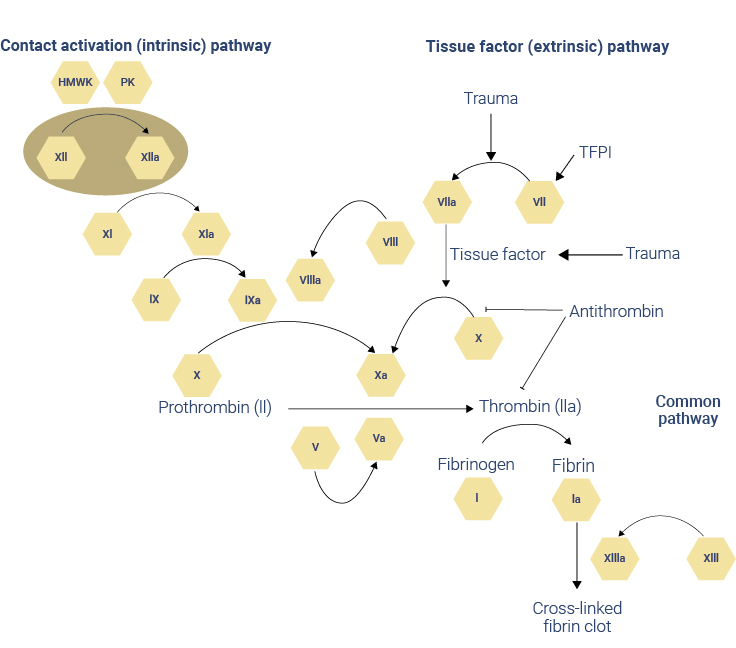 Kaolin-based hemostatic dressing improves hemorrhage control from a penetrating inferior vena cava injury in coagulopathic swine. J Trauma Acute Care Surg. 2017;83(1):71-76. 5. Carson JL, Altman DG, Duff A, et al. Risk of bacterial infection associated with allogenic blood transfusion among patients undergoing hip fracture repair. Transfusion. 1999 Jul; 39(7):694-700. 6. Morton J, Anastassopoulos KP, Patel ST, et al. Frequency and outcomes of blood products transfusion across procedures and clinical conditions warranting inpatient care: an analysis of the 2004 healthcare cost and utilization project nationwide inpatient sample database. Am J Med Qual. 2010 Jul/Aug; 25(4):289-296. 7. Stokes ME, Ye X, Shah M, et al. Impact of bleeding-related complications and/ or blood product transfusions on hospital costs in inpatient surgical patients. BMC Health Serv Res. 2011; 11:135. 8. Dee KC, Puleo DA, Bizios R. An Introduction to Tissue-Biomaterial Interactions. Hoboken, NJ: Wiley & Sons; 2002.